The network shown in the above Diagram contains a discontinuous network, 172.30.0.0. This network has been subnetted using VLSM. The 172.30.0.0 subnets are physically and logically divided by at least one other classful or major network, in this case the two serial networks 209.165.200.228/30 and 209.165.200.232/30. This can be an issue when the routing protocol used does not include enough Information to distinguish the individual subnets. 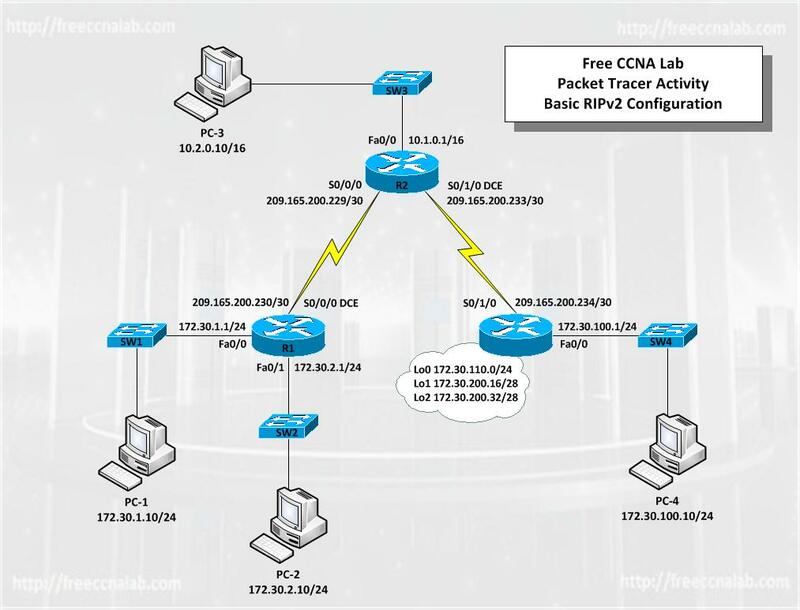 In this lab you will use RIPv2 a classless routing protocol to provide subnet mask information in the routing updates. This will allow VLSM subnet information to be propagated throughout the network. RIPv2 is a classless, distance vector routing protocol as defined in RFC 1723. Because RIPv2 is a classless routing protocol, which means, it includes the subnet mask with the network addresses in the routing updates. As with other classless routing protocols, RIPv2 supports CIDR supernets, VLSM and discontinuous networks. Due to the deficiencies of RIPv1, RIP version 2 (RIPv2) was developed sometime in 1993. It’s equipped with the ability to support subnet information and supports Classless Inter-Domain Routing (CIDR). A router that receives routing updates from multiple routers advertising the same classful summary route cannot determine which subnets belong to which summary route. This inability leads to unexpected results including misrouted packets. However, with RIPv2 automatic summarization can be disabled with the no auto-summary command. Automatic summarization must be disabled to support discontinuous networks. RIPv2 still maintains the hop count limit of 15 and incorporated a password authentication mechanism. However, passwords were transmitted in clear-text format, which were found insufficient for secure communications on the Internet. The default version of RIP is version 1. The command version 2 is used to modify RIPv1 to RIPv2. Use The show ip protocols command to view that RIP is now sending and receiving version 2 updates and whether or not automatic summarization is in effect. Use of holddown and other timers to help prevent routing loops. Use of split horizon or split horizon with poison reverse to also help prevent routing loops. Use of triggered updates when there is a change in the topology for faster convergence. Maximum hop count limit of 15 hops, with the hop count of 16 signifying an unreachable network.